October is the month dedicated to celebrating everything that goes bump in the night, and across East Multnomah County people of all ages are getting into the spooky spirit as the days countdown to Halloween. 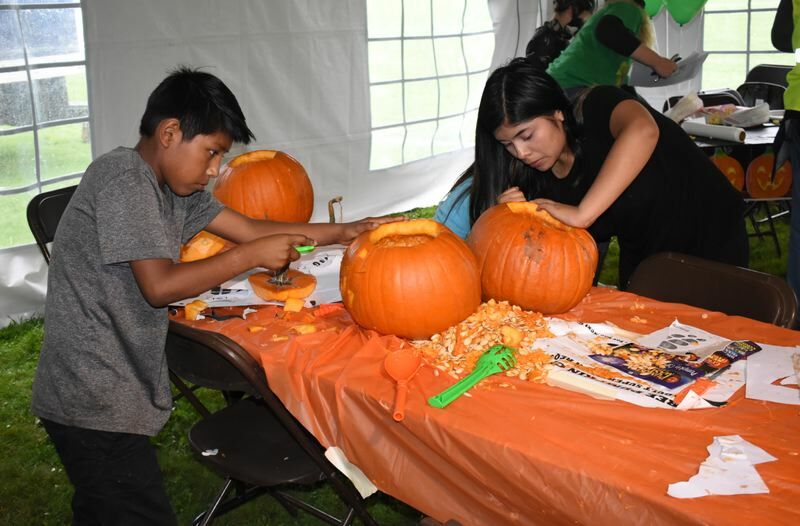 In Wood Village on Saturday, Oct. 27, families got into the spirit with the annual Great Pumpkin Fest at Donald Robertson Park, 24300 N.E. Halsey St., that celebrated everything pumpkin. 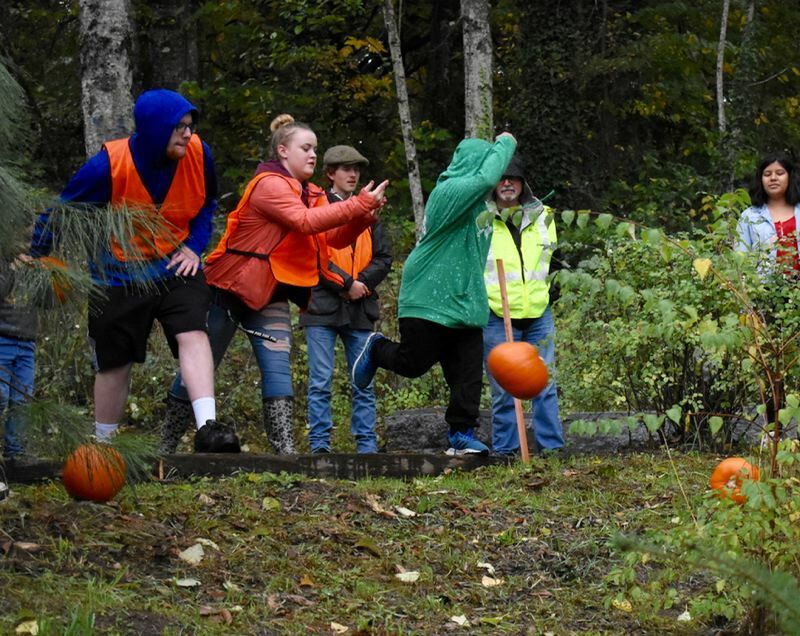 Pumpkin enthusiasts walked through heavy rain and climbed to the top of a hill to get a chance to roll the orange gourds as far as they could toss. Wood Village City Recorder Greg Dirks encouraged participants who were staying dry under a tent for earlier activities to brave the rain and enjoy the festival's finale. "You might get a little wet, but if you want to enjoy chucking a pumpkin down a city park, this is the only time of year to do it," Dirks said. Those who made the eight-minute walk, with a pumpkin in tow, were rewarded by bowling that gourd down a hill. With the exception of a traditional Aztec dance, every festival activity involved a pumpkin. The events included a pie-baking contest, pumpkin carving and a pie-eating contest. The pies, of course, were of the pumpkin variety. 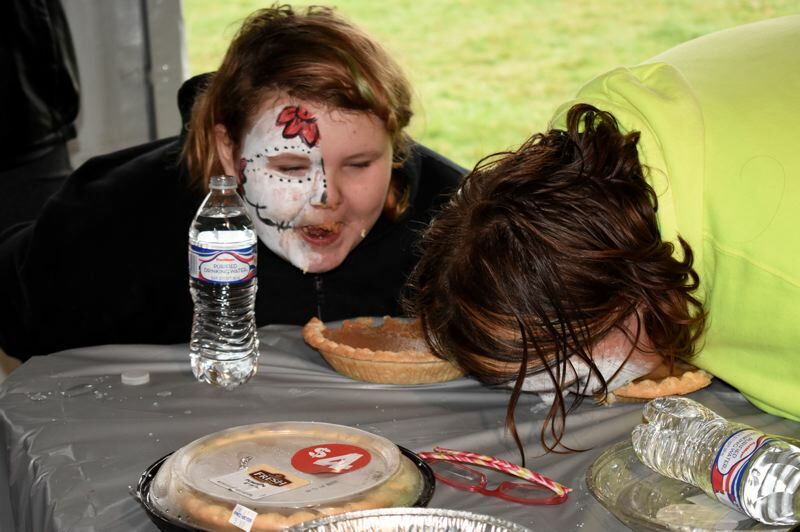 Sadie Davis, 13, handily won the contest as she was the only participant to actually finish an entire pie. "A couple of times I had to take a break because I thought I was going to puke," Sadie said. But then she looked at her competition and realized that no one was on her tail, and she could relax and sip some water before diving back in. The seven children competing in the event were not allowed to use their hands, except to drink water. During the eating portion, participants kept their hands behind their chairs. 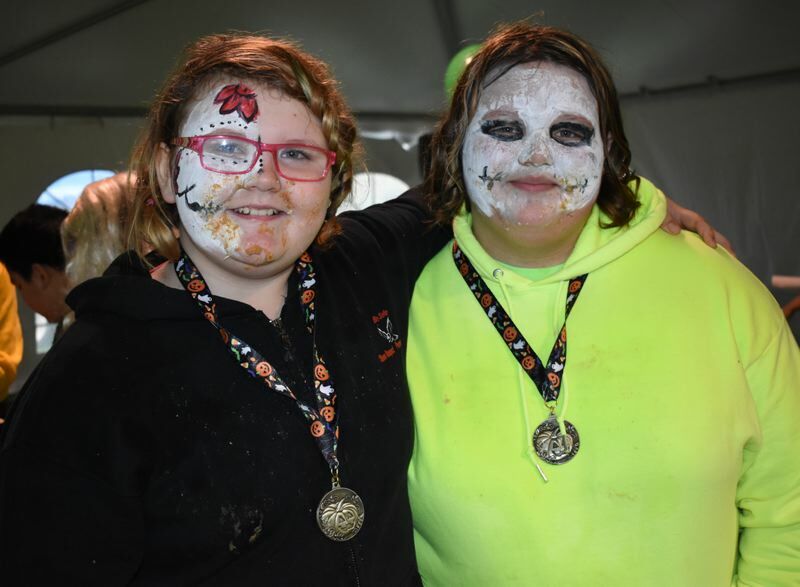 The only other eater to even come close to finishing was Sadie's younger sister, 10-year-old Kelsey Davis, who took second. Dirks awarded the siblings medals, along with gift certificates to Fred Meyer. 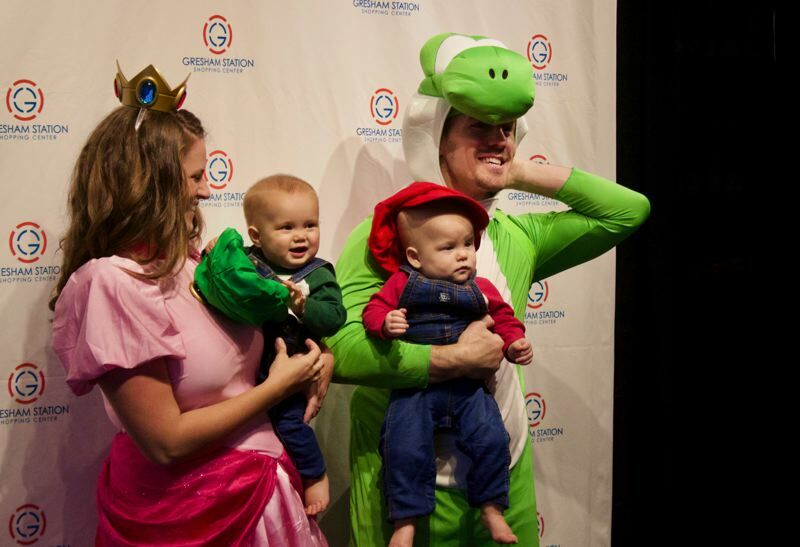 Hundreds visited Gresham Station over the weekend, as the new property managers of the shopping center wanted to continue a tradition of screening a Halloween family movie while expanding to create a fun time for the whole community. "We just took ownership and we wanted to keep the traditions while adding onto them," said Scott Anderson, senior property manager with Harsch Investment Properties. "This is a way to bring everyone together." On Saturday afternoon at Gresham Station, there were tasty treats, a costume contest, giant pumpkin carving by three master carvers, and a screening of "Hocus Pocus." Gresham Station is planning to have more events in the future, such as for Black Friday and a Christmas bash that may include reindeer. For the costume contest, those who couldn't wait to show off their Halloween costumes entered for a chance to win gift cards for vendors throughout Gresham Station — or a trip to Disneyland. There were princesses, animals, witches, trolls, skeletons, mermaids and much more. 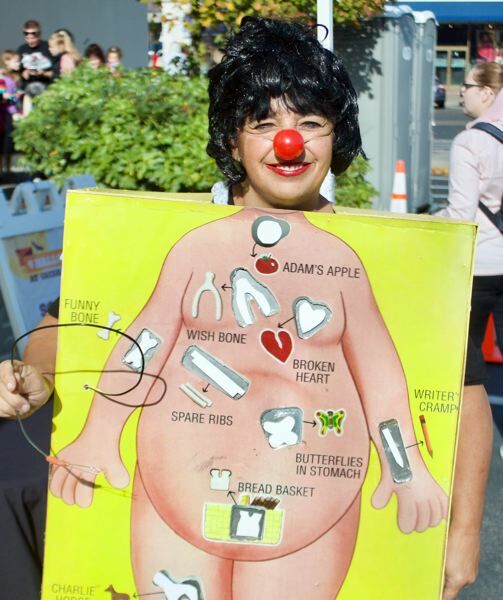 Tanya Forman, who lives in southeast Portland, was dressed up as the board game Operation, which even had working lights and a buzzer. She made it with her family, as Halloween is always a time for them to do things together. "We always love Halloween. My house becomes holiday central," Forman said. Her favorite part is dressing up and decorating her home, and adding to the fun is her birthday was on Sunday, Oct. 28. "This is just a great time of the year," she said. Many of the contestants made their own costumes, though one little girl's initial idea made her parents be extra creative. 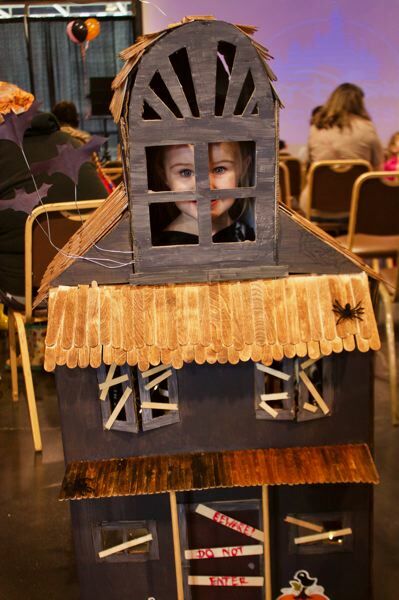 Brooklynn, 4, who lives in Gresham, wanted to be a haunted house. Two days later her parents finished the costume, complete with lights in the windows. While the costume contest was going on, three master pumpkin carvers were hard at work on their creations. Bert Adams, Lorie Gordon and Lisa Donzeg were set up at stations around the center, carving locally grown gourds that weighed about 250 pounds, and chatting with people interested in the process. All of them agreed that while they go into a carving with an idea in mind, the pumpkin always dictates what they make. The thickness of the flesh and unique curves all make a difference. "I like working with pumpkins because it is non-toxic and quick," Adams said. "A lot can get done in a short amount of time, and it's peaceful." Back at Wood Village's festival, families spent the day carving pumpkins together. Dirks spent the first three hours of the event cutting off the tops of the gourds for families to carve. He broke three knives while cutting open hundreds of pumpkins. The Marcelo family took advantage of the city's free pumpkins. Brenda Marcelo, 12, carved pumpkins with her younger twin siblings, 9-year-olds Anabel and Gonzalo. Brenda said they enjoy this time of year, but their mother didn't want to pay for pumpkins when that money could go to buying food. So the children headed to the Wood Village's festival to snag free decorations. 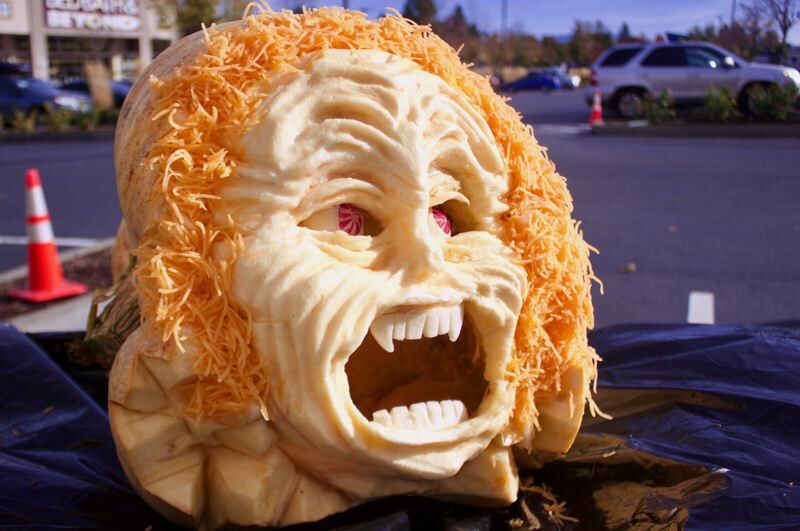 "We love carving pumpkins and this season," Brenda said. "It's a time to gather together."